What are you expecting to get out of the interior of the vehicle that you drive? What features are you seeking? There is a good chance that the popular luxury SUV that is the Volvo XC90 will provide you with everything that you want. Are you concerned about getting the interior of your vehicle to just the right temperature when you are driving? Are you afraid that you and your passengers will be too cold or too warm while driving around? 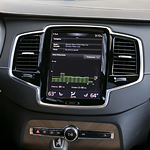 The Volvo XC90 comes equipped with a standard 4-zone electronic climate system that will help you stay comfortable. Are you looking for a few extra luxuries that you can use and appreciate when it comes to the interior of your vehicle? Are you looking for features that will help you feel special? The Volvo XC90 comes equipped with heated front seats, helping you to feel warm and special while driving.